What It’s About: Pasqualino (Giancarlo Giannini) is an Italian deserter on the Eastern Front during the Second World War who is captured and put in a concentration camp. As he attempts to survive the hell he in which finds himself, he flashes back on the journey that took him there, starting with his days as a small-time hood in pre-war Italy, saddled with seven ugly, unmarried sisters (the “beauties” of the title) and an exaggerated sense of honor. Why Watch it Today? : Cult actor Fernando Rey, who died today in 1994, has a small but pivotal role as an anarchist that Pasqualino meets in the concentration camp. 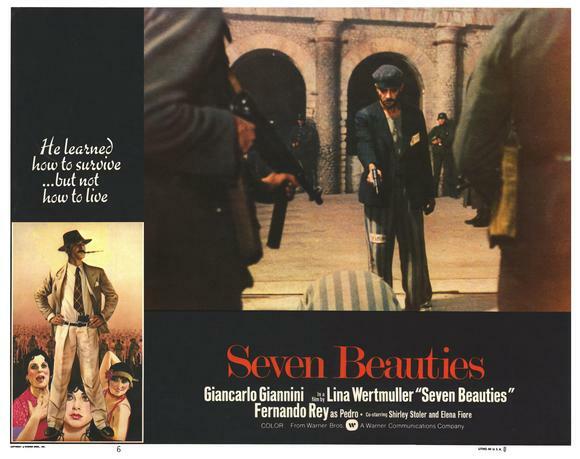 Seven Beauties is an alternately blackly comic and tragic film from writer/director Lina Wertmuller that is unlike any other film about the Second World War (and life and survival) you are likely to see. Wertmuller received the first Best Director nomination given to a woman, as well as a nomination for Best Original Screenplay, while Giannini received an Oscar nomination for his powerhouse performance as Pasqualino, an idiot everyman, who makes it through the harrowing experiences of murder, prison, an asylum, the Second World War, and collaborating in a concentration camp and seems to learn nothing. A must see. This entry was posted in "Foreign Film", Arthouse, Black Comedy, Drama, Gangster, Movie of the Day, War Movies and tagged anarchist, asylum, concentration camp, Fernando Rey, Giancarlo Giannini, Jadran Film, Lina Wertmuller, Medusa Produzione, Shirley Stoler, World War Two. I just saw this today. Great movie and I didn’t know about Fernando Rey’s recent passing. I gotta watch more of his stuff. Rey actually passed away in 1994, so not-so-recently, we just use any important date, holiday, event, or date in the films themselves to fill out our movie-of-the-day feature. It really is an amazing movie, though, one of my personal favorites.